MARTINSVILLE, Va. (AP) — Joey Logano leads two rows of Ford drivers to the green flag Sunday at Martinsville Speedway, the first stop at a short track in this young NASCAR season. Logano won at Martinsville last fall by bumping Martin Truex Jr. out of the lead in the final turn of the playoff race. The maneuver earned Logano a slot in NASCAR’s championship and he won his first Cup title three weeks later. He is starting from the pole in his No. 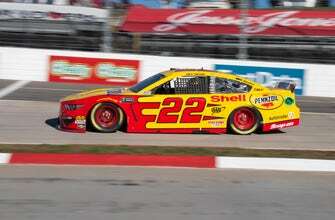 22 Team Penske Ford for the fifth time in the last nine races at Martinsville. Ford drivers Aric Almirola, Brad Keselowski and Kevin Harvick round out the front two rows. Kyle Busch is seeking his third consecutive Cup victory and a sweep of the Martinsville weekend. He won the Truck Series race on Saturday, and the last two Cup races at Phoenix and California.